Small Builders has a new feature. This update will help you to save time and effort in integrating your expenses. 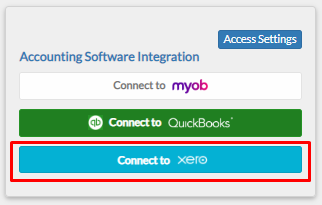 From your projects dashboard under Accounting Software Integration, click Connect to XERO. 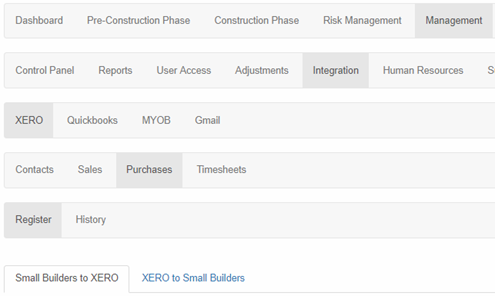 From your navigation bar, go to Management > Integration > XERO > Purchases > Register > Small Builders to XERO. 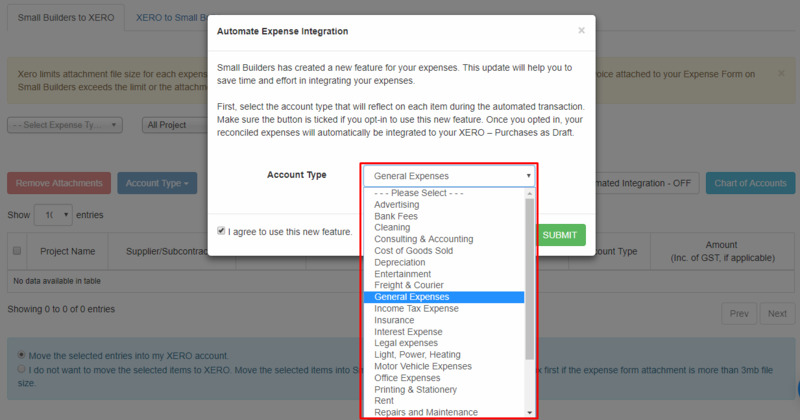 Or type in ‘XERO – Purchases’ on the search bar located in the upper right corner of your portal. 2. On integration page, you will see the Automated Integration - OFF button. This means that you are not currently opted-in. Click the button to view the details. 3. A pop-up window will appear giving an overview of the new feature. Select the Account Type that will reflect on each item during the automated transaction. 4. You will be asked if you want to use the feature. By default, the checkbox is ticked. Click Submit to opt-in. Note: A success message will be displayed and the button will become GREEN with Automated Integration - ON text. a. The Supplier/Invoice Date/Due Date is blank. b. Attachment exceeds the 3MB file size limit. c. The supplier is not active in XERO app. When an expense with attachment is integrated, the attachment is transferred as well. You will know if the expense has attachment if it displays on the Invoice Attachment column on the integration page. 6. Expenses automatically integrated are highlighted in GRAY, while the items integrated manually are in PLAIN WHITE. 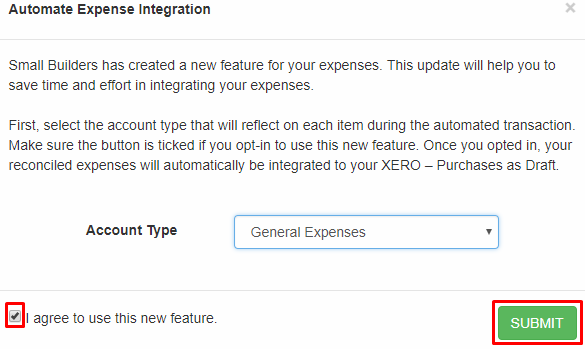 Note: All the integrated expenses on the automation follows the Account Type you determined from the time you opted in. 1. Click the Automated Integration - ON button then click OK to confirm. The button will become GRAY with Automated Integration - OFF text. Note: If in case you want to change the account type that will reflect on each item during the automated transaction, you must opt out then opt in again. Only then you can change the account type that will be reflected on the next items that will be integrated automatically. As you opt-in to the feature, your reconciled expenses are automatically integrated at the scheduled time. This occurs every n:15, n:30, n:45, and n:00. And every scheduled time, the page refreshes and prepares the items to be transferred. At 08:15, the automatic integration will run and will process reconciled expenses submitted until this time. The next run time will be at 08:30.